The USPTO Office Action ruled that two patents had anticipated claim 18 of Apple’s U.S. Patent no. 8,074,172, according to a filing Thursday by Samsung in the U.S. District Court for the Northern District of California, San Jose division. The patent figured in a recent trial in the California court, where a jury ruled in May that Samsung should pay Apple about US$119 million in damages for infringing three patents. Claim 18 of the ‘172 patent was asserted against Samsung. District Judge Lucy H. Koh had ruled in January that Samsung products had infringed the ‘172 patent. Samsung’s filing stated that it was bringing the USPTO decision to the notice of the court as it was relevant to its defense in connection with the ‘172 patent, but does not discuss the implications of the decision on the damages award against it. 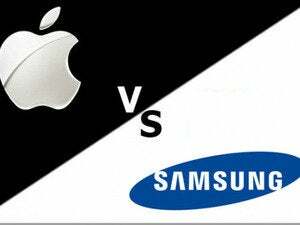 One element of Samsung’s strategy has been to invalidate Apple patents which have been asserted against it. In the U.S., Samsung asked the California court in July to hold invalid claims of two other Apple patents in the wake of a U.S. Supreme Court decision in Alice v. CLS Bank that raised patentability standards. The Apple patents are the ’721 patent, also known as the “slide-to-unlock” patent, and the ’959 patent, known as the “universal search” patent. The two patents had also figured in the trial, but Samsung products were only found to infringe the ‘721 patent.